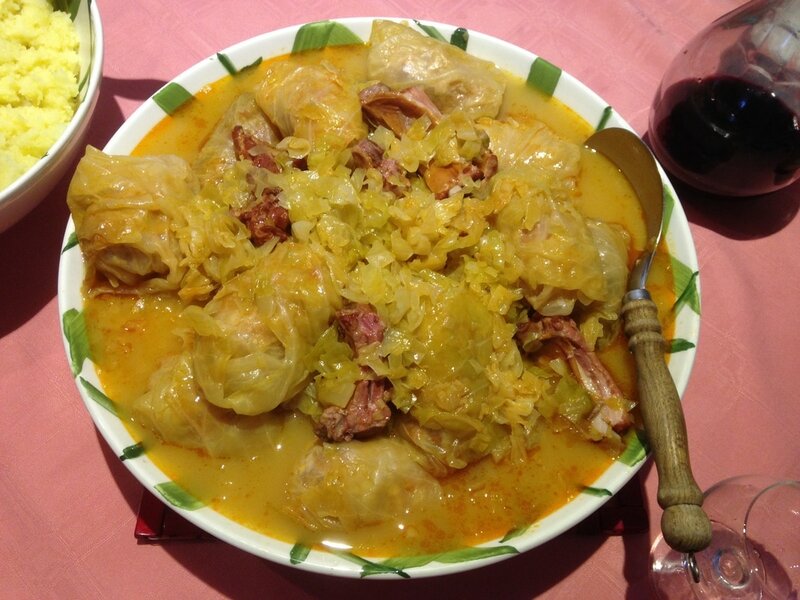 For years I was going to Croatian weddings and I would have Sarma. This is not food I grew up on at home. 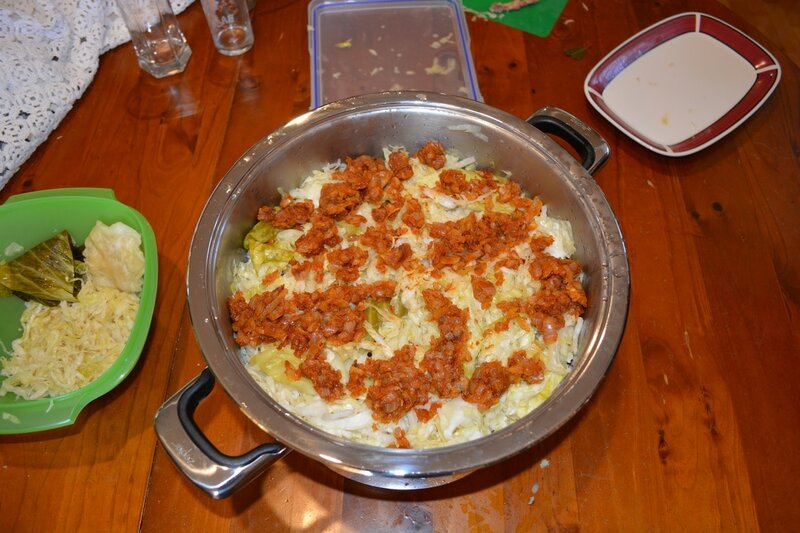 When I was little, my mum made Stuffed Capsicums a lot, but never Sarma. 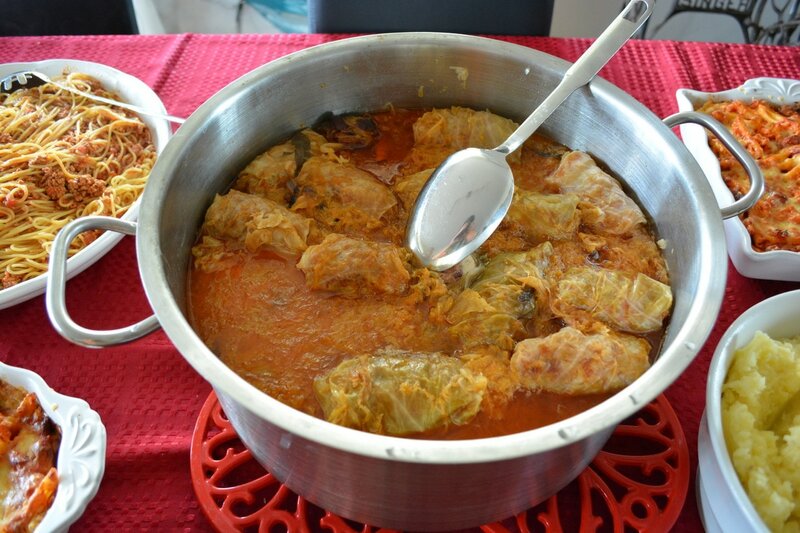 After I got married and left home, my mother learnt how to make Sarma, she likes trying new things, as I do now, and this is how she makes it and now I do to. We all now love it and it is extremely popular at parties when she makes it. Now this I say is Croatian, as I've only ever tried a Croatian version, however, I'm not sure where it originated. You can easily use store bought sauerkraut, or very soon I'll post how to make your own. I must confess I do love our own sauerkraut better, but am happy with store bought also. 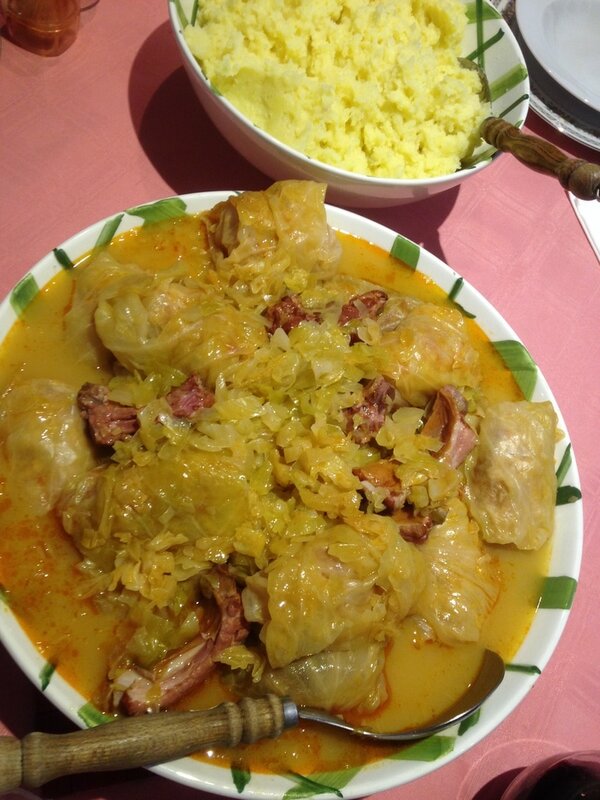 This recipe can be doubled, just keep layering the sarma in the saucepan, as needed. ​These days you can buy pickled cabbage leaves already separated, if you can't find a whole head of cabbage, feel free to use these. Rinsing the cabbage and sauerkraut: This all depends on how sour the sauerkraut is. I taste the sauerkraut and cabbage, if I like the flavour, I don't rinse it. If it is strong and very sour, then it needs a rinse, that does depends on the sauerkraut and your taste buds. 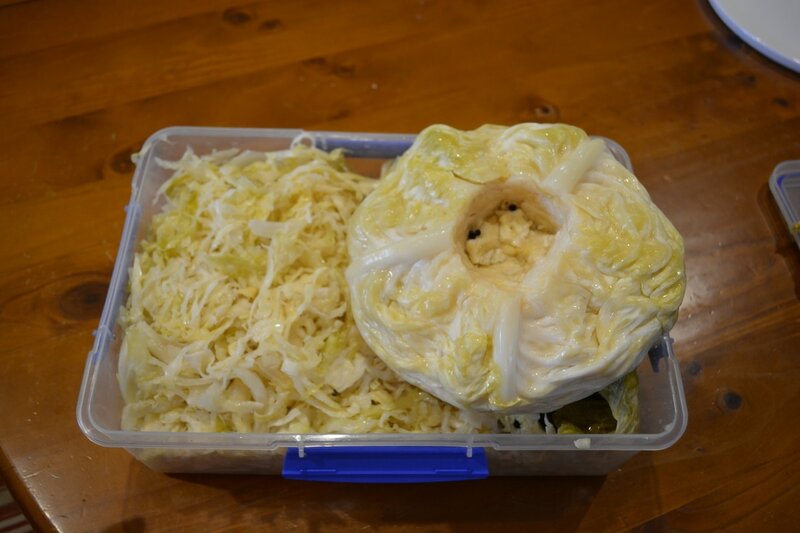 I do say to cut off the thick rib of the cabbage, however, I quite like it, so sometimes I leave it in, my mum never would, but I don't like superfine sauerkraut, so I like it. If you cut it out, don't throw it away, slice it up and add the other sauerkraut. With cabbage leaves you want them to be similar in size, for even cooking, I don't care for just my family, but if I was doing this for others, I would, so you can cut large leaves in half, or join two smaller leaves together as you go, if you want same sized Sarme. With the mince, you want to gently form a sausage shape in your hands, but don't compress them too hard, you want it to be soft, not dense. Now I have written 10-12 tablespoons of soda water, I will explain why. As you are adding uncooked rice to the mince mixture, if you added no soda water, the rice would absorb moisture from the mince and you would be left with hard, dry, boring mince in your cabbage rolls. So I add soda water, so that the rice can draw on that to cook through in the cabbage rolls. I add 3 tablespoons of soda water initially, mix it in with you hands. Now I keep adding soda water, 2 tablespoons at a time, until I feel the mince is moist, but not wet, you don't want a pool of water in the bottom of your bowl. 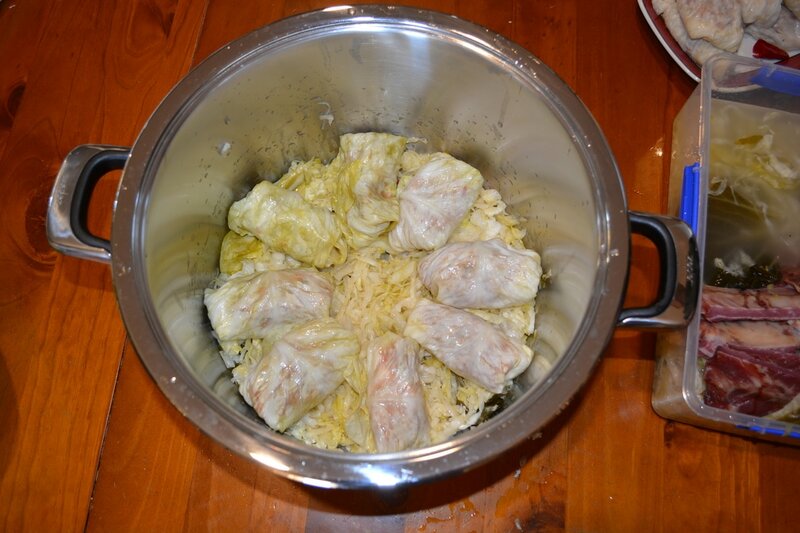 Cabbage rolls are tastier the next day, so it a great make ahead meal. You can also bake them instead. Just assemble and place in a baking dish, place in a preheated 150C for about 2 1/4 hours. So here is a great dish, that my family loves, hopes yours do to. Separate and rinse the cabbage leaves in warm water. Cut off the outer (thick) ribs without damaging the leaves. Set them aside. If the leaves are too large they can be halved. Place the minced meat in a bowl, add the parsley, salt, pepper, rice, garlic and 1 tablespoon of the paprika. Now add three tablespoons of the soda water, mix it all together. 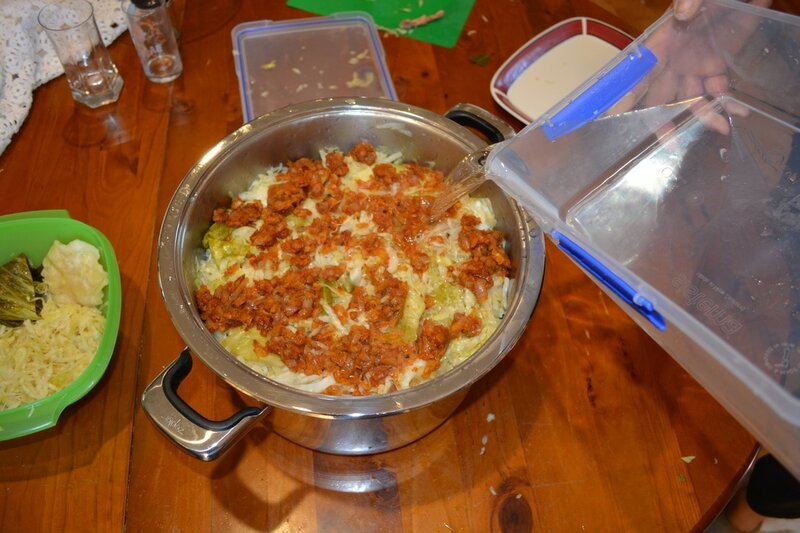 Keep adding more soda water 2 tablespoons at a time, until your mince feels damp, but not wet. (Read notes in intro, regarding the soda water). 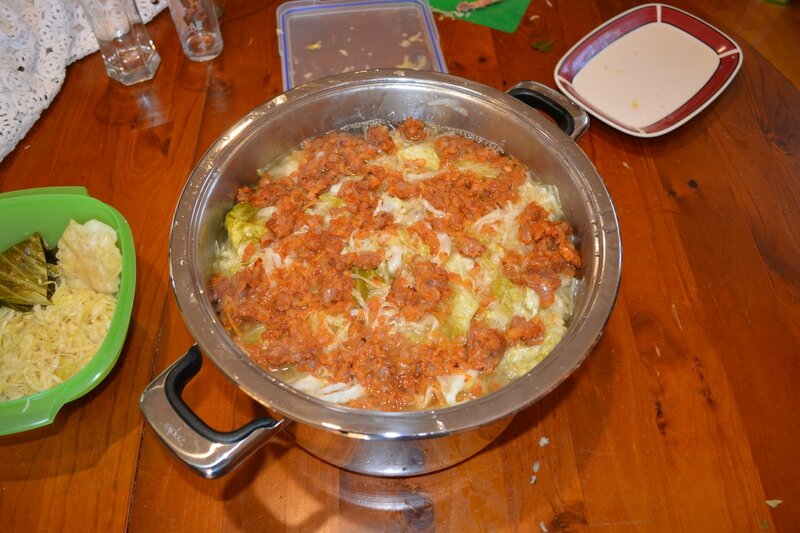 Place enough filling (about 2 tablespoons) into the centre of each cabbage leaf and roll it up, tucking in the edges. Repeat until all the mince is used up. Cut any remaining cabbage leaves into fine strips and combine with the sauerkraut. Rinse the sauerkraut, drain thoroughly. 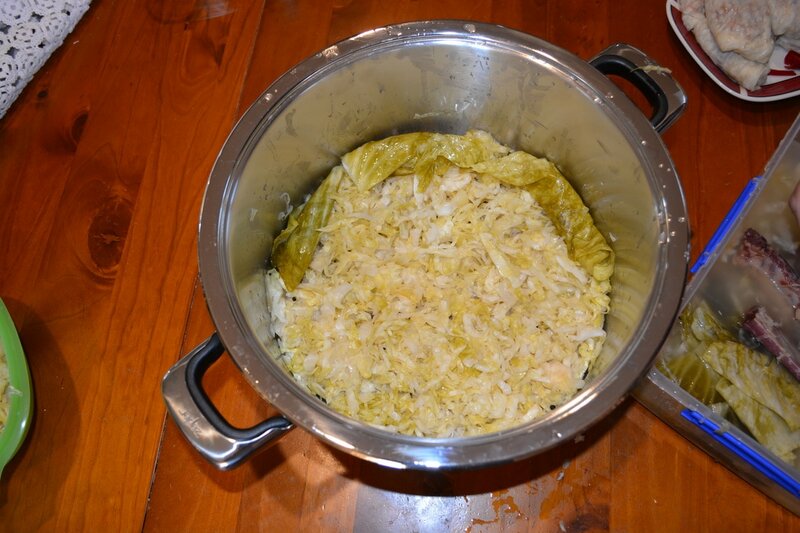 Line the bottom of your saucepan with half of the sauerkraut. 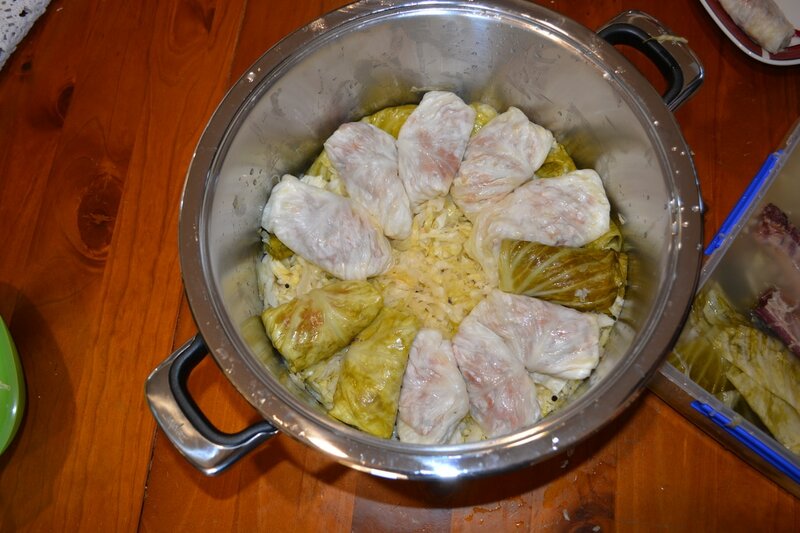 Arrange the cabbage rolls next to each other in a circle leaving the centre of the circle free. Fill the centre with your smoked ribs. If you doubled the recipe, keep layering. Cover the top with the sauerkraut. ​In a separate frying pan, fry the diced onion in oil until golden in colour. Add the flour and remaining 1 tablespoon of paprika and fry for about 1 minute. Remove from the heat, add 1 cup of cold water, stir continuously to prevent lumps from forming, add more water if it is too thick still. Pour the roux over the cabbage rolls. Now pour over enough water (or stock, you can add a bit of vegeta here if you like), to cover them. 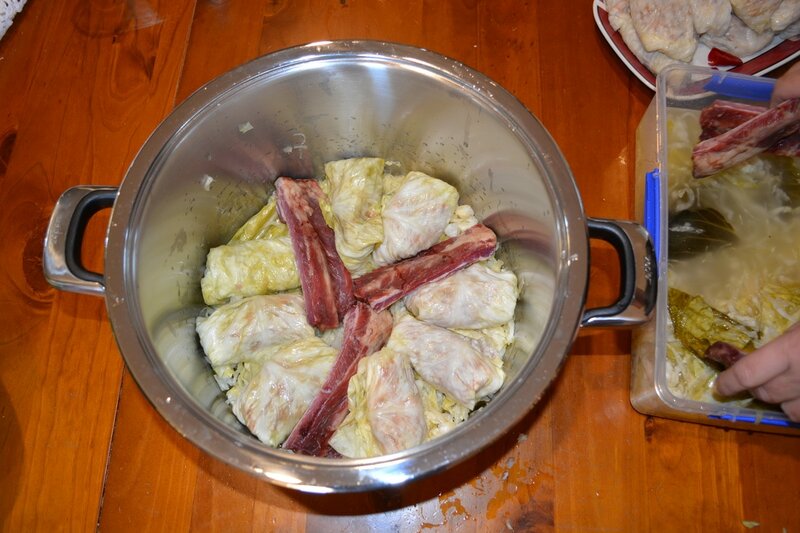 ​Cover, place over a medium heat and allow to the sarma to come to the boil. Once it boils, reduce the heat to low, simmer for about 3 hours. Every now and them shake the saucepan to prevent anything sticking to the bottom of the saucepan.